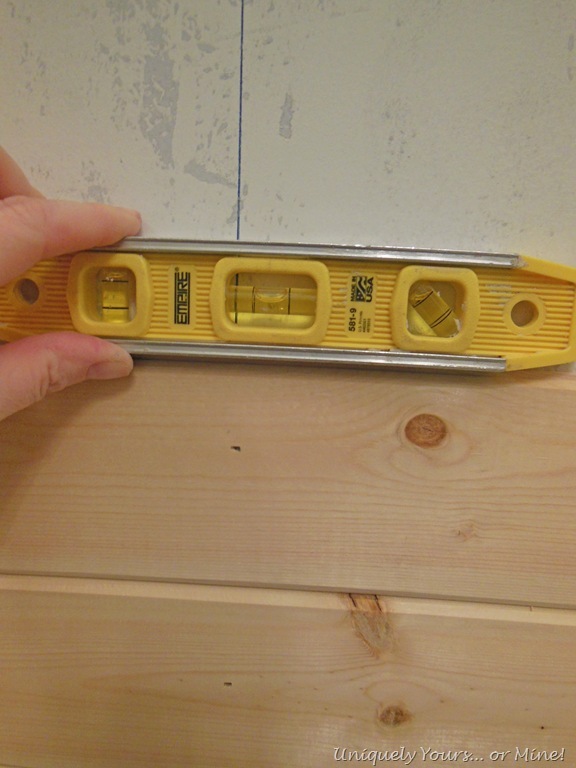 Installing Wood Planking in the Bathroom – Uniquely Yours… or Mine! 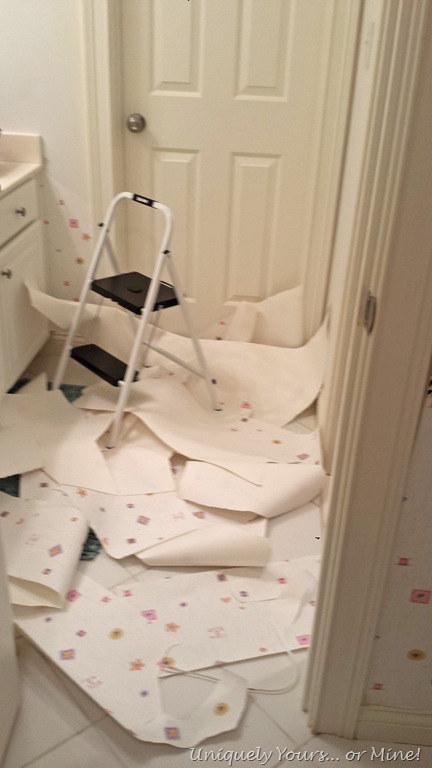 The bathroom was wallpapered, the paper wasn’t bad just not for us, so it had to go! So Sierra (our eldest) and I took it down (hey she volunteered I promise)!! It came down SUPER fast, in full sheets, with minimal effort… how lucky can you get right? First we bought about 12 packages of these EverTrue V Groove pine wood planks & 4 packages of EverTrue Wainscot from Lowes. We also picked up some crown molding & small chair rail piece to finish off the look. In case you are interested we spent roughly $450 for everything this project. Hubby cut the boards to size and I installed them one by one leveling each board or every other board depending on how accurate or lazy I was feeling at the time, but mostly it was every board. I would not have even attempted to do this project if we didn’t have a nail gun! I attached each board to the wall with a dab of Power Grab and a couple of nails. 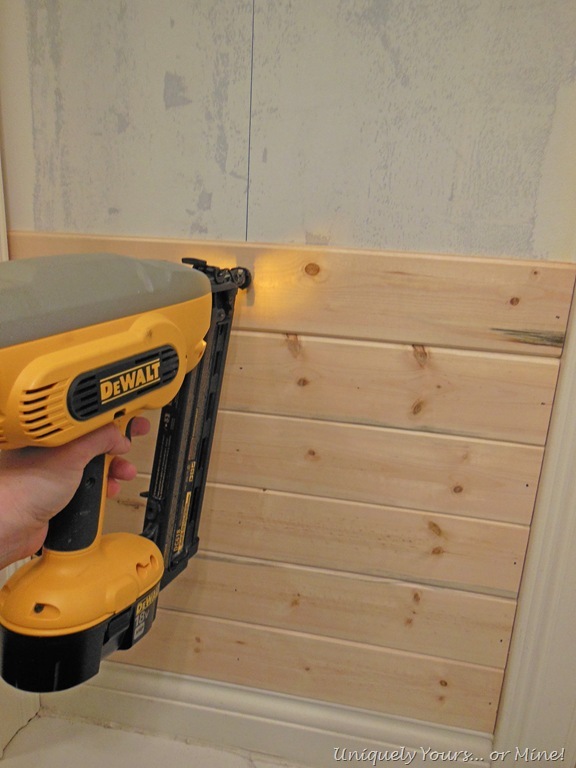 I had marked the stud locations using a stud finder and a level… these boards are NOT coming off of these walls! After installing all of the horizontal planks I then installed the vertical tongue and groove boards. I placed the nails in such a way that the crown molding and chair rail would cover them so I didn’t need to fill those holes… a small time saver! 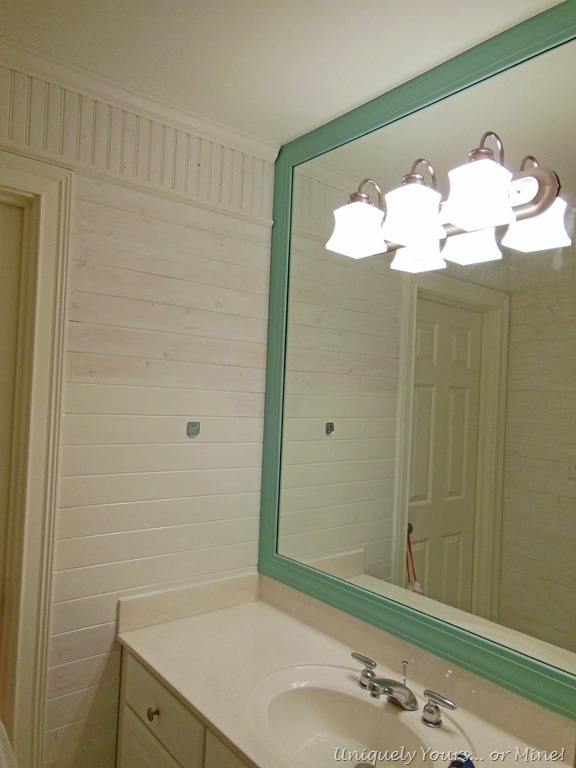 I was filling holes and caulking while Hubby was measuring and cutting… the process worked out very well for us and went pretty fast in the vanity areas. Because the boards are so thin we were able to slip them behind the toilet without having to remove it… SCORE!! 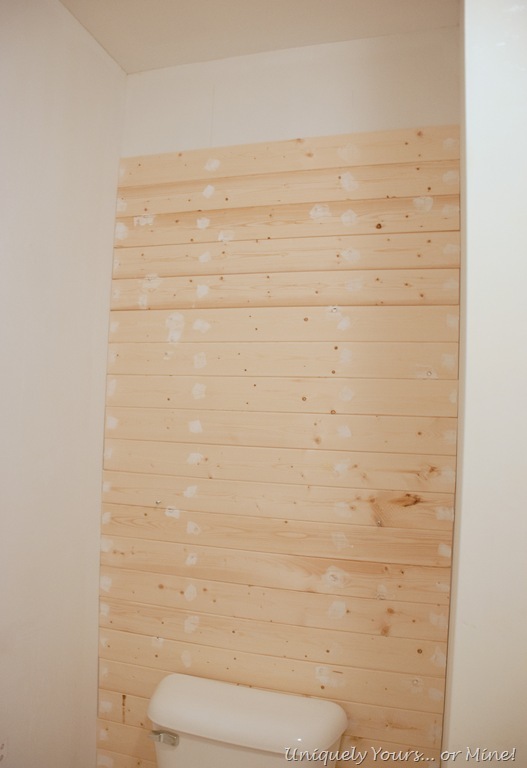 By the way I filled all of the holes with vinyl wall spackle, it sands smooth, leave no identifiable hole, dried super fast and was very easy to work with. 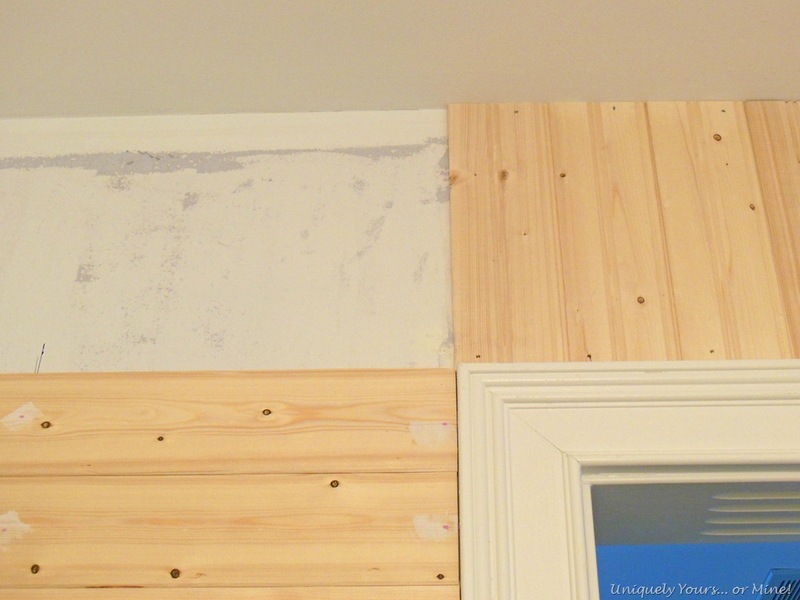 I think I got a little nail happy on these boards… yikes! 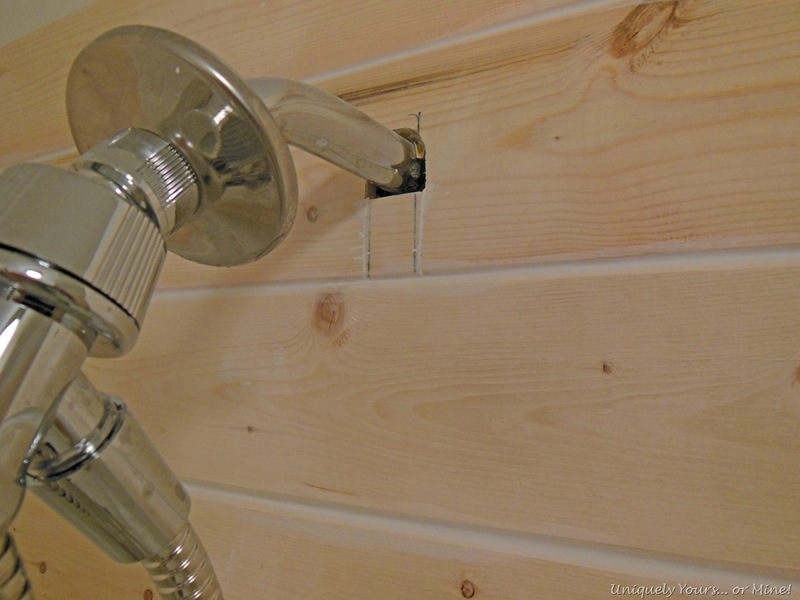 We used the jigsaw to make cuts around light switches and other obstructions and here we cutout for the showerhead and then glued the piece back in… worked like a charm! Also you can see here that I filled all of the grooves (shower area only) with caulk, a preventative measure in case moisture gets up there, I don’t want it to get behind the boards and cause problems. Now you should see a clearer picture of where this is all going! We installed crown (no instructions because we are SOOO not qualified to give them, this was a bear) and the small chair rail. 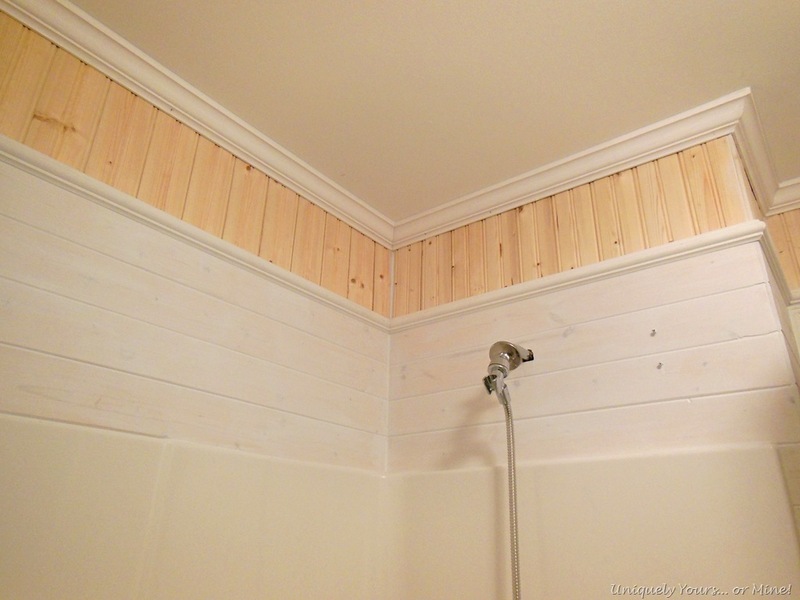 I caulked where the crown met the ceiling and where the chair rail met the horizontal boards, but not where they met the bead board… I don’t like the way that caulk fills the grooves on the bead board. The corners, interior and exterior, get caulked as well… I was caulking for a LONG time! I almost forgot… we have framed the mirrors and changed out the globes as well. The going is a little slower than anticipated due to some carpal tunnel problems with my right hand / wrist and I am clearly unable to paint very well with my left which seems ridiculous but true! I’m hoping to wrap up the wall painting this weekend. If you are interested I would say this project is a solid 2 out of 5 on the skill level, the most difficult cuts being the miter ones, but it is rather time consuming so keep that in mind! 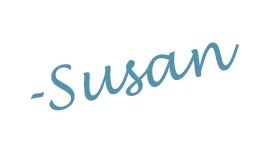 I’d love to hear what you think of the space so far… I love reading your comments! What a beautiful transformation! I just love planked walls! Thanks Sharon! It’s taken quite a toll on my wrists but it will be worth it! Wow, that looks like a lot of work! But the end result is going to be so worth it! Love the inspiration photo. You go girl! Thanks so much Andi! My husband and I tend to work as a team when it comes to these kinds of jobs. He likes to use his power tools and who am I to complain right 😉 he likes being handy and feeling needed and I like company so it works great! 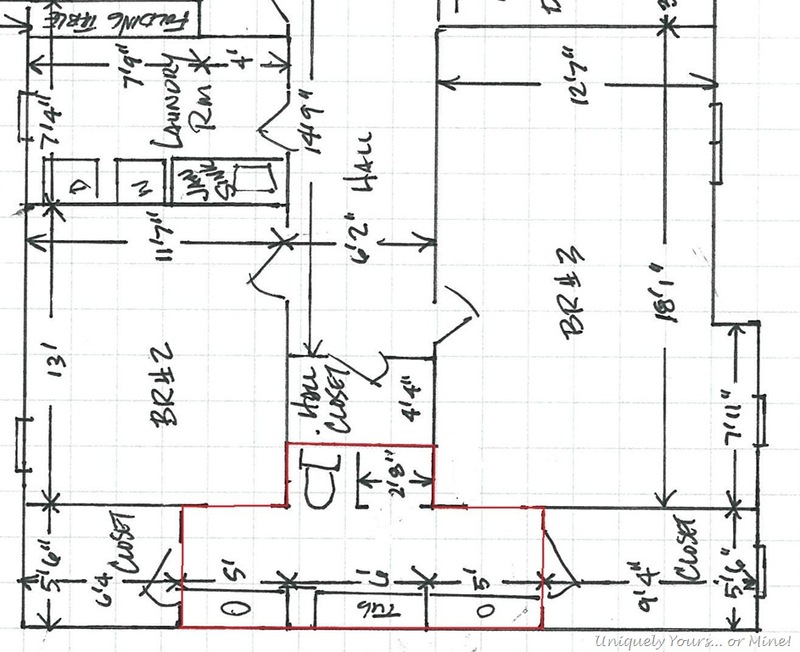 LOVE LOVE the planked walls…can’t wait to see the full reveal! 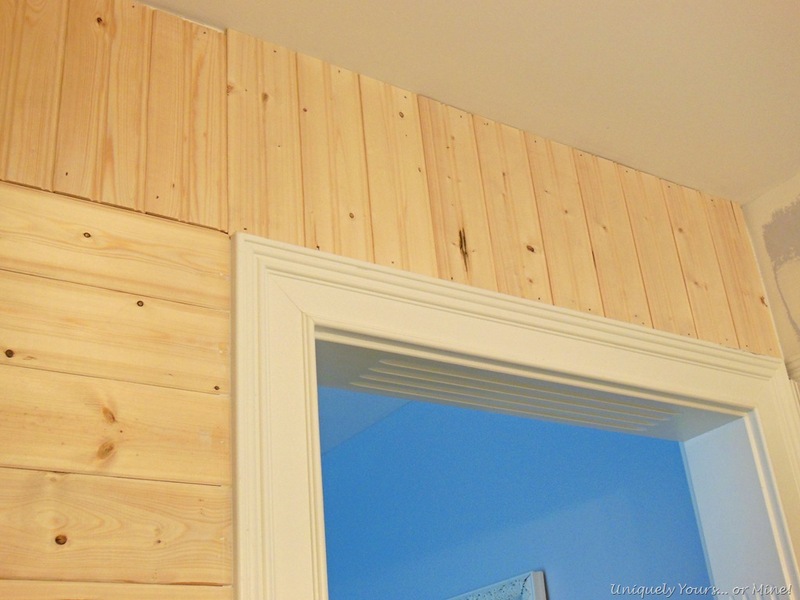 Thanks Martina, I JUST finished this morning so I’m hoping to get the post written etc this weekend..
Pingback: Installing Wood Planks on the Bathroom Walls | Uniquely Yours... or Mine! Thanks so much Jenna! Here are my suggestions, bring the wood inside to acclimate to the house before cutting or installing, prime the wood before painting and use an oil based paint. I almost used oil based paint in the shower area but decided that there was no need because of the tub surround being so high. Oil base is not fun to use but it’s the best for that application I think. Hope this helps, good luck with your project! Pingback: Laundry Room Update In Progress | Uniquely Yours... or Mine! Pingback: Beautiful Laundry Room Makeover | Uniquely Yours... or Mine! 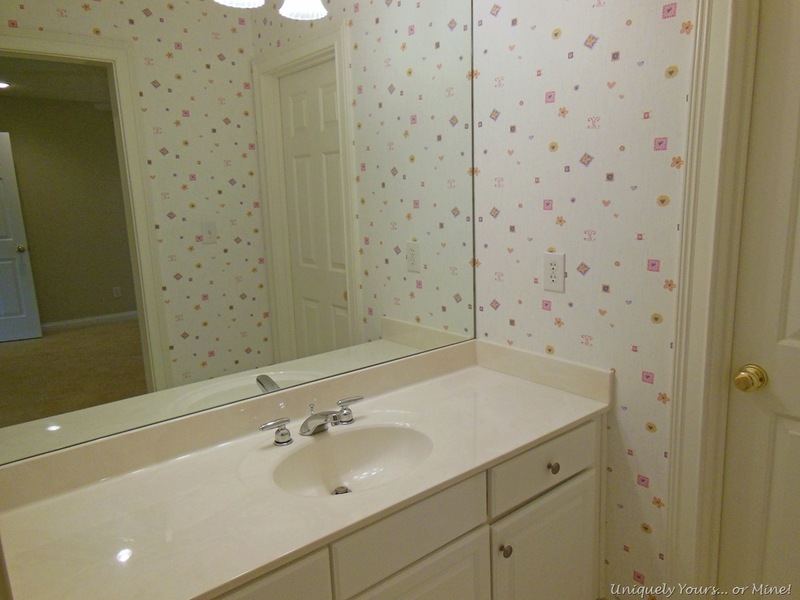 Pingback: The Princess Suite Bathroom Renovation | Uniquely Yours... or Mine!